The Israeli government recently dropped its policy of seeking to evict at least 40,000 Bedouin nomads, although the true figure may well be double that estimate, from their ancestral lands in the Negev desert. The Prawer plan’s key objective is to forcibly dispossess the nomads off their homesteads, demolish their makeshift settlements with military bulldozers, and then relocate them into government approved concrete villages. The plan has been dropped, at least for now. But when the world’s attention looks elsewhere the evictions program will almost certainly be reconvened. The ‘backward’ Bedouins are, after all, according to the logic of state induced development, manifestly in the way of social and economic progress. The Bedouin nomads, long characterised as ‘unproductive wanderers in the wilderness’, as indeed most travelling peoples have historically been perceived, have, at least for now, been temporarily saved. Unfortunately the same cannot be said for other nomadic societies. As unjust as the Israeli nation building policy is, as a program of coercive nomadic resettlement it pales in comparison, in scope and in scale, with a much larger catastrophe for global nomadic culture currently playing out in the great plains of western China-the Western Development Program, Xabu Da Kaifa in Chinese. Xabu da Kaifa, loosely translate as ‘open up the west’, is an extensive, top-down bureaucratic program of economic engineering, and social and cultural transformation, sweeping across the region, clearing the way for hyper capitalist development. As a result, since 2000 in western China, approximately two million Tibetan pastoralist nomads have been systematically cleared off the Tibetan plateau (an area larger in size than western Europe)and resettled in ‘new socialist villages’- a contradictory euphemism if ever there was one from communist China’s all conquering model of top-down authoritarian capitalism. The parallels with the Negev villagisation program in Israel are stark, moreover, both policies of enforced sedentarisation serve similar purposes: regulation, control and socio-economic, and almost inevitably in the Tibetan case, as a policy by-product, cultural assimilation and integration. Moreover, the Chinese policy of compulsory resettlement is no ‘accidental’ by-product of rapid industrial development. China’s rationale for the resettlement rests on the ecological preservation of the region’s by now depleted grasslands. The nomads have been blamed for desertification by Chinese Development experts, which, given their thousands of years of socio-cultural preservation of the grasslands, is, to say the least, a somewhat bizarre development proposition to claim. Nevertheless, this rationale for the displacement of the nomads pervades Chinese development discourse, as can be evidenced here. Unfortunately for the nomads when they have been displaced, socialist villages are more often than not concrete ghettoes hastily constructed on the side of newly built highways. Semi-urbanised ghettoes full of apathy, cultural and social dislocation, bourgeoning social problems such as drug abuse, once unknown to the nomads, are now common- a once proud wandering people now largely reduced to meagre state hand-outs. In addition, the forced resettlement of the nomads is a function of rapid economic development, coupled, quite consciously, with the deliberate cultural policies of imposing a Chinese language only education. There are relevant historical parallels. The near extermination of the indigenous tribes of the Americas by European colonial settlers is all too apparent. And, just as the theft of Indian land on the North American continent in the 18th and 19th century was rationalised in the name of proselytizing Christianity and capitalist expansion, a broadly similar process is being played out with the forced displacement of Tibetan nomads. Only this time, international development organisations have taken the place of evangelising Christian missionaries, hand in hand with Chinese development agencies. A different ideology of course, but with a broadly similar purpose: the imposition of a commercial and cultural value system replacing traditional practices and knowledge, and crucially, resource exploitation. The OECD, for example, being a case in point. In a recent assessment of the region’s potential, the international development organization employed the ubiquitous and all powerful language of economic progress in evaluating the region’s potential — asset intensification, focal points of investment, capital augmentation, finance speculation, investment strategies. All seemingly value neutral terms, all, apparently, part of the same inevitability. Who, after all, can be against progress and wealth creation? Yet scratch beneath the surface and there is one ultimate objective: embedding neo-liberal development. Since 1999 the Chinese government has been pouring billions of state investment into its western regions in an effort to realize the region’s wealth producing capacity. Xabu Da Kaifa is transforming the region and inexorably pulling the area’s rich source of raw materials and its vast ‘empty wilderness’ into the administrative and commercial orbit of the shiny cities of the east coast, where an anomalous hybrid of capitalistic progress and scientific socialism coexist. Further still, the objective is to pull the western ‘treasure house’ of China into the trajectory of economic globalisation, as a source of both international investment and cheap commodities amongst other things. Consequently, there are now hundreds of thousands of kilometers of railways, roads, highways, pipelines and dozens of newly built airports.Huge hydro dams and enormous mines for mineral extraction are also being constructed at a breath taking pace – the vast wilds of western China ( Tibet, Qinghai, Sichuan, Xinjiang and Gansu) one of the world’s last frontiers withstanding global capital expansion, is being transformed, forever. The western landmass has an underutilised strategic and commercial asset for China. Therefore, inevitably, in order to develop the area, pastoral nomadism on the great central Asian plains has been condemned as inefficient, unproductive, and backward. And by the inexorable logic of state development, the ‘irrational’ pastoral nomads, in the name of social and economic nation building, must be reconstructed into rational peasants-all the better to be measured, controlled, and prepared for efficient economic viability by China’s ruling urban elites. In truth, sadly, economic servitude is the best they can now hope for. For the worst, one need not look too far for historical or contemporary instances of the myriad social, economic and spiritual effects of sedentarisation on nomadic populations. The socio-economic conditions of Australia’s Aboriginal peoples serve as a salutary lesson for the fate of all wandering peoples. Closer to home in Europe, Irish travellers have been suffering the impact of state indifference and its occasional correlate, coercive intrusion, for decades. Xabu Da Kaifa’s policies and programs signal the eradication of 4,000 years old culture of self sustaining nomadism, a rich knowledge base which we should be preserving for today’s ecology challenges, rather than destroying it. The world’s second biggest economy is often seen as a model for the rest of the developing world. China’s double-digit economic growth stands as a beacon for all who would seek follow in its footsteps- where China goes, Brazil, Mexico, India and South Africa are eagerly following. All have large nomadic communities. 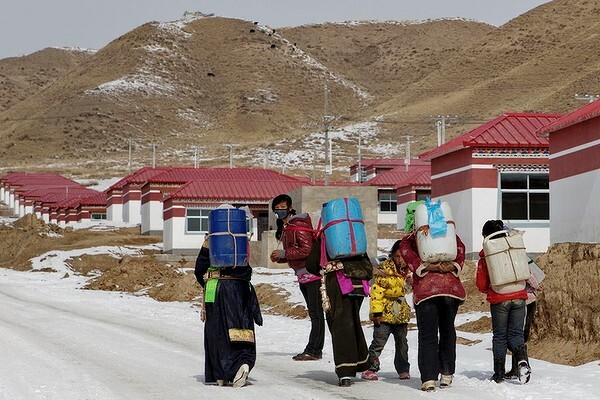 At this late stage for global nomadism facing the onslaught of industrial development, is the fate of the Tibetan nomads, and others, to be the fate of all nomads? Mark Kernan is a writer based in Ireland.